Just a quickie post today... and I'm sure that many of my normal buddies won't be posting this week. It's "Screen Free Week" - but I'm not really participating. Call me a rebel. I know that there WILL be other posts at Teach Mentor Texts, so be sure to stop by! 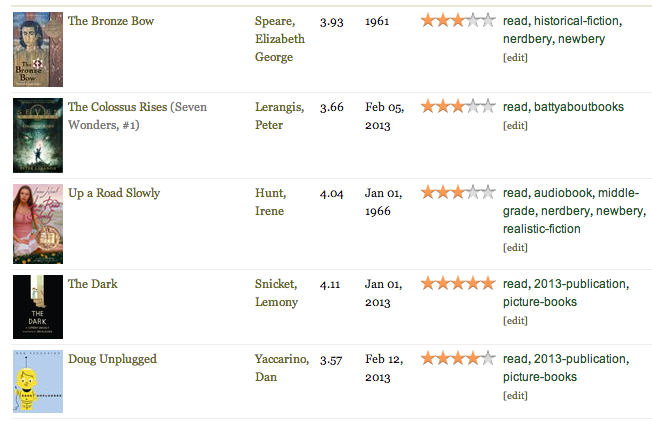 Not many "wow" books this week... though I did get through two more Newbery books! That takes me to 74. Thursday - "New to Who - Geekling Edition" A favorite post from the week, where I reflect on what my boys think of Doctor Who so far! Sunday "Batty About Colossus Rises" - Kathy and I wrap up our discussion.